This year marks the 45th anniversary of the opening of Disneyland's Haunted Mansion and Disney (never one to miss a promotional opportunity) has decided to start the party early rather than wait an additional 5 years for the Golden Jubilee. The internet is filled with all sorts of news about new merchandise, a tv special, and a delicious teaser for a new movie. All this can be pretty hard to navigate for some, but for those of us who feel that the Haunted Mansion is quite possibly the greatest ride the parks have ever created, it's a fine time to once again join the 999 happy haunts and celebrate. In order to start things off right, I have compiled a guide bursting with spooky goodness and ideas for all levels of Haunted Mansion fans – from the tech buffs to the all out Disney-phile. So hop in your doom buggy, relax, and just make sure you keep an eye out for unwanted hitchhikers. The voice of the Ghost Host, a disembodied spirit who guides guests through the ride, is that of Paul Frees. A major talent and well-known for his voice-over work, Paul Frees also voiced Boris in the Rocky and Bullwinkle cartoons as well as several characters for Rankin/Bass productions. The original plan was to make the Haunted Mansion a walk-through attraction. However, since the project took so long to complete, ride technology took a huge jump with the creation of the Omnimover, a continuous chain of cars that can spin, pivot, and point the guests directly at what the ride creators want them to see. Painted black and dubbed Doom Buggies, these not only helped to create a better experience for the guests but created a way for the park to move more guests through the attraction at a faster rate. There are actually different versions of the Haunted Mansion across the Disney parks. While Disney World and Tokyo are essentially the same, and there are only slight/minor differences between World and Land, Disneyland Paris's version has a storyline much more in line with the ride's placement in Frontier Land. Instead of a more general experience with a progression of acts rather than story, the Phantom Manor in Paris tells the tale of a ghostly bride and the sad circumstances around her ill-fated wedding. Each Winter/Fall, the Disneyland Haunted Mansion gets a Nightmare Before Christmas overlay, essentially creating an entirely new ride. It looks amazing, and if you are the type who doesn't mind spoilers, you can check it out here. 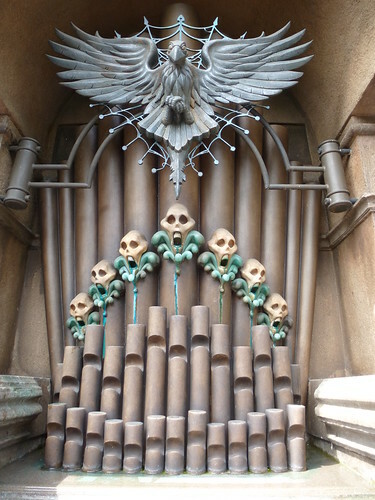 DoomBuggies.com – Created in 1997, this site has been and certainly still is an exhaustive resource on everything Haunted Mansion related. It is almost too much. Key word here being almost. Stuff You Missed in History Class – Think of this as the Cliff Notes version for those who just want the basic run down including a few juicy tid-bits. This would make great commuter listening. The Haunted Mansion: From the Magic Kingdom to the Movies by Jason Surrell - Published by Disney Editions, this is the Disney sanctioned book about the Mansion. Still, when you go to the source, that means great quality photographs and a lot of respect for the subject matter. The only problem is that whole last bit about the film. For those of us who found the film nigh-unwatchable, the chapter about the film feels disappointing and a lot less interesting than the rest of the book. There is no reason to wait for Halloween to host a bash that folks would be dying to attend! Get it? Dying? Cause they're ghosts... Anywho, the idea of a Haunted Mansion themed dinner party is so wonderful that Disney hosted one last year for some insanely lucky people. The menu is posted if you follow the link I've provided, so if you want to steal ideas from the pros, have at it. You can also come up with your own ideas, or maybe try some Creole or Cajun fare inspired New Orleans themed house in Disneyland? The Bride's Chopped Salad – use an ax to cut up the vegetables, it's more authentic that way! Celebration Style 3: Total Immersion! Want to share your love for the Haunted Mansion or just pray that Del Toro doesn't cast a bored Eddie Murphy in his new film? Post below and let us know your thoughts, ghostly or otherwise.